registrations, or 0.7 percent over the third quarter of 2016. Domain name registrations have grown by 21.0 million, or 6.8 percent, year over year. Total country-code TLD (ccTLD) domain name registrations were approximately 142.7 million, a 1.8 percent increase over the third quarter of 2016, and a 3.1 percent increase year over year. The .com and .net TLDs had a combined total of approximately 142.2 million domain name registrations in the domain name base in the fourth quarter of 2016. This represents a 1.7 percent increase year over year. As of Dec. 31, 2016, the .com domain name base totaled 126.9 million domain name registrations, while the .net domain name base totaled 15.3 million domain name registrations. New .com and .net domain name registrations totaled 8.8 million during the fourth quarter of 2016. In the fourth quarter of 2015, new .com and .net domain name registrations totaled 12.2 million. 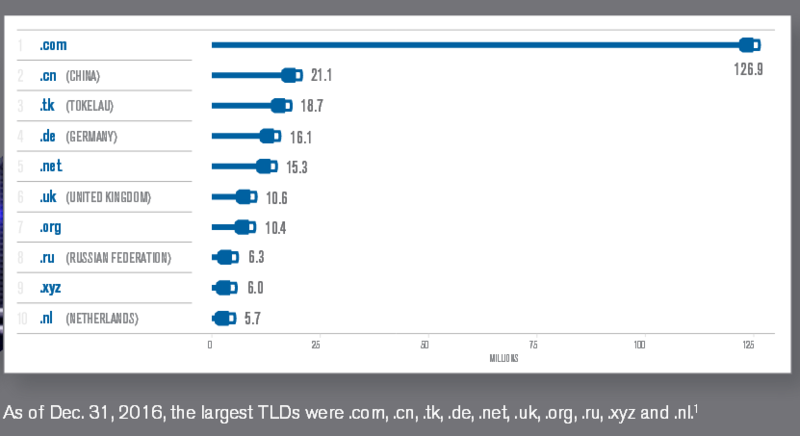 Verisign the administrator of the .com and .net TLDs publishes the Domain Name Industry Brief to provide internet users throughout the world with statistical and analytical research and data on the domain name industry.